I decided to add a glaze of Ultramarine Violet to intensify the background. I chose the purple color to contrast with the yellow and gold of the flower focal point. 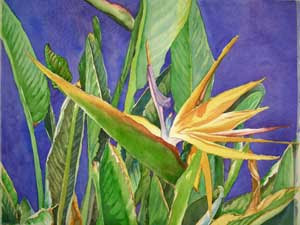 I have also added another glaze to many of the green leaves. Each glaze intensifies the color without making the image muddy. Next, I added some Alizarin Crimson to the shadow areas of the flower, including the green area at the base of the flower head. The combination of green and cool red glazes really darkens and warms the value of the shadows. Alizarin Crimson is a cool red and works great in shadow areas of both warm and cool areas. Good luck on your classes Debbie. I am sure they will grow quickly. I wish I were close enoungh to join but I am in North Florida (Lake City/Lake Butler area). I enjoy your blog.